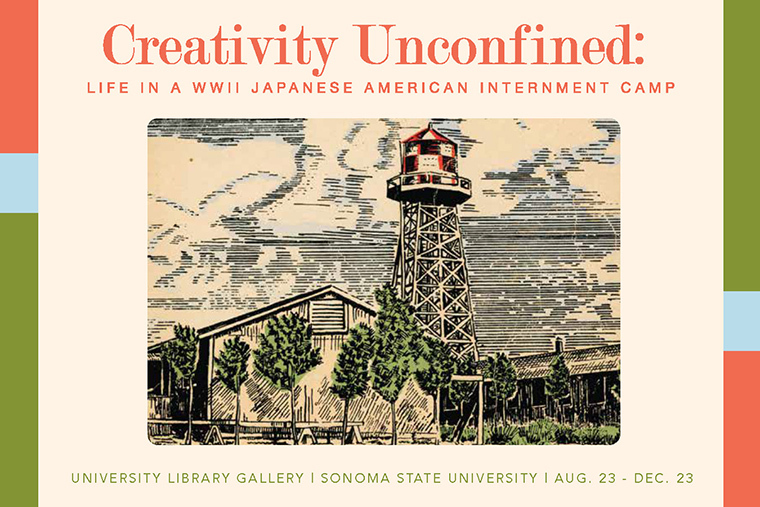 Silk-screened posters, woodcuts made from vegetable crates, paper flowers, yucca root lamps and many other items are on display in the Sonoma State University Library Art Gallery exhibition, Creativity Unconfined: Life in a World War II Japanese American Internment Camp, running Aug. 23-Dec. 23. During World War II, the forceful removal of people of Japanese descent from the West Coast sent nearly 120,000 people, two-thirds of whom were American citizens, into incarceration camps within our nation's interior. Despite an unjust situation and harsh, unforgiving landscapes, internees prevailed, revealing an unbreakable spirit. The items made by internees give a glimpse into the life at Amache, exposing the surprising beauty and creativity that blossomed from behind barbed wire. "They used what they had there and turned it into art," says exhibition coordinator and Sonoma State University oral historian and staff archeologist, Dana Ogo Shew. "What I want to get out of this is the focus on the creativity and the art and the beauty that was created in this harsh, unforgiving landscape, and highlight how they made they best of it." The exhibition was made possible in large part by a grant from the National Endowment for the Humanities. Pieces of the collection will be digitized and added to the Library's digital special collection with the oral histories behind the objects. "We know a lot of people self-curate these materials in their homes, and we wanted a way to preserve, digitize and share their collections," says Shew. Most items in the exhibition come from the internment camp at Amache, Colorado, which was known for its silkscreen shop. The shop produced over 250,000 posters for the U.S. Navy, in addition to other projects. Internees also carved their own furniture and artwork from discarded wood found at the barracks, and even made jewelry out of peach pits. "This is such a human story," says Shew. "There are real people with complicated lives attached to these artifacts. It's a reminder that internment had long-term effects on people's families." The gallery is free and open to the public. A free reception will be held Tuesday, Sept. 13, 4-6 p.m., email events@sonoma.edu or call 664-2712 to RSVP. The campus parking fee will be waived for the September 13 reception for those who RSVP. Parking on campus all other days is $5-$8.